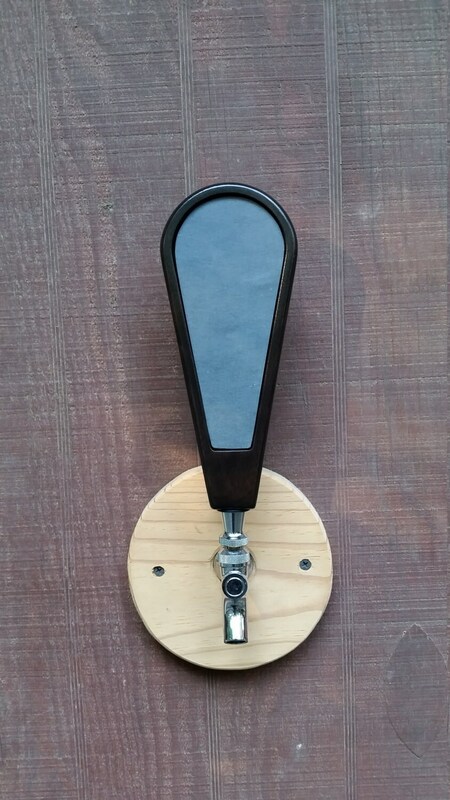 Cherry beer tap handle in a Brown Mahogany finish with a real slate chalkboard. Never forget what beer is in the keg. Great for home bars. Pull dimensions are 8" long x 3 1/4" wide at the top tapering to 1" x 1" thick. Great for home bars. Designed for 3/8" -16 threaded beer tap systems (most common). Installation instructions and chalk included. I have tested the Chalk Pens sold at Michael's and they work great on the Slate Chalkboard inserts I use. I have had no issues with "shadows" of the ink even after leaving the ink on for a month. A slightly damp cloth will remove the ink with no problems.